I'm a bit late with our post today so apologies if you called by earlier. I've had a really crafty day making some new samples and gifts for our Stamp Magic ticket winners too. I made an extra project to for this months giveaway. Pictured above, it's one of my double photo frames altered with papers from the Couture collection. It holds two 4 x 6 photos that slide in and out from the top so you can swap and change them easily. If you'd like to be in with a chance to win it, just leave your comment on this post before midnight on 29th June. The winner will be announced on 30th here on the blog. I'm loving the introductions to this years new G45 Design team. Andrew yesterday and Annette today. If you fancy taking a look at their fabulous projects click here. There are more introductions for each of the new team members on their blog over the next couple of weeks. Oh Clare, I love this and would love to win it!!! I just had 7 teeth pulled this morning!!!! I am o.k. and doing fine, I will be so gorgeous when they get all this done, ha, ha!!!! Just resting for the rest of the day!!! Did want to tell you how beautiful this is. Again thanks for being who you are and sharing your talent with us!!! Talk to you soon. Another brilliant design Clare. I love this photo frame and would love to win it. 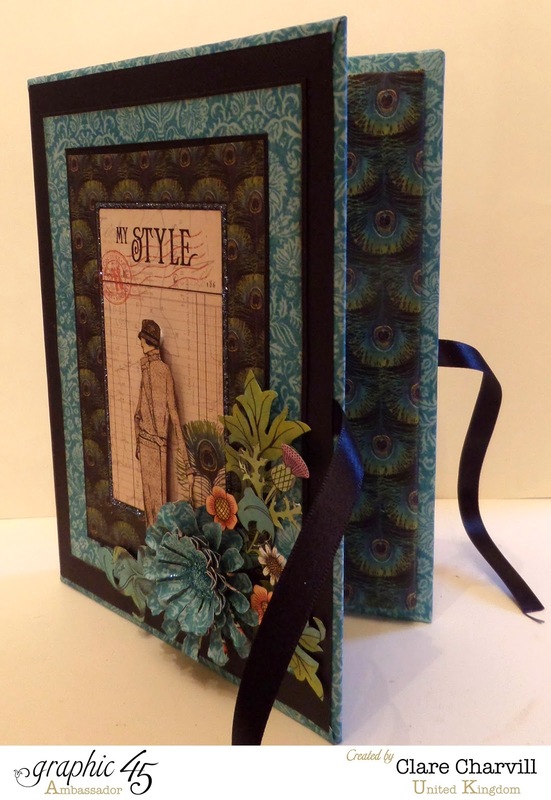 The couture papers are one of the most versatile collections. Thanks for the opportunity to own one of your pieces of artwork. Thank you for yet another inspirational project. 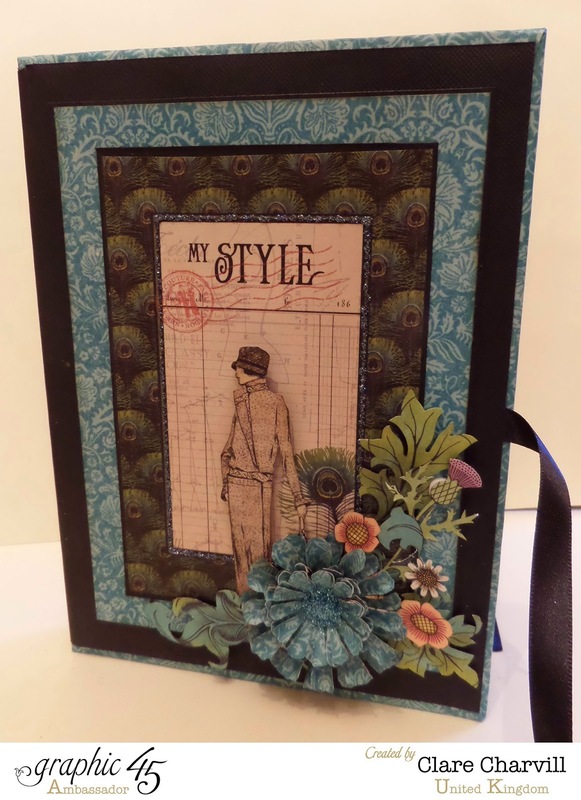 I have always loved Graphic 45 papers but until I met you and saw your projects I was always frightened to cut them up.....well, that's no longer the case. I love this photo frame, the papers are gorgeous,as always with Graphic 45 - but what a lovely gift it would make for someone. this is a gorgeous vintage project Clare. Morning Clare, Wow !! absolutely stunning photo frames, the papers are gorgeous, gorgeous, gorgeous. I would love to Win this 'work of Art' !! Thank you for your work! I love your work! Hi Clare, what a beautiful photo frame, Love the colours, love the era, I think I should have been born then, everything was very elegant. As ever your work is stunning, thank you for sharing your talent. As always, your project is an inspiration. So very beautiful! Love it! Love it ...have just the pictures for it !! What a nice photo frame booklet! Thanks for the chance at the giveaway and, as always, for the inspiration, Clare. Beautiful as always. Love the design and what a beautiful way to frame those images that are special! Once again another fabulous project Clare which I should love to win. Love it! Thanks for sharing this and hope you enjoy the rest of your evening. Gorgeous frame and the colours are fab. Would have pride of place on the sideboard if I was lucky enough to win. The colors are lovely. Something made by you would be a treasure! Thank you for the chance. Lovely project Clare, I love g45. Love this project. So simple and yet ver effective, could be adapted in terms of size and paper collection used. Beautiful project...my birthday is June 29th...this would be a perfect present ! Wow, someday I will be that good!. That it's simply beautiful. I've more added another thing to try on my list. Thank you. How I would love to add this to my Wall of Fame!! I try to get some piece that has been done by a favorite designer whenever I can and it goes up on the shelf for my Wall of Fame... It is a small but elite group (according to my taste) and I would be thrilled to have a project from you since you are one of my favs!! Hi Claire....I LOVE your work and your ideas and designs are always so creative! I always look forward to what you are going to create next! Brilliant!! I have always loved your work -and even have downloaded everything I could of yours so I can refer to it. You teach me SOOO much about working carefully and neatly. Your ideas are gorgeous. Wish I were in the UK so I could meet you. Wow, Clare! What an amazing, beautiful and functional project. I am sure whoever wins this will cherish it immensely! Love your work and thank you for sharing your talents with us all. Can't wait to see what you do with your box of goodies - it must have set your heart racing to see all that in the box. Happy crafting!! Your work is beautiful! I find your creativity most inspiring! I am about to begin chemotherapy to help battle a Stage 3 cancer. I will have many extra hours to spend at my craft table during the months to come. Thanks for sharing your work...would love to win this giveaway! You do such beautiful work and I love watching your videos. Thanks for a chance to win. I would love, love, love to win it! I just recently found you and am addicted! 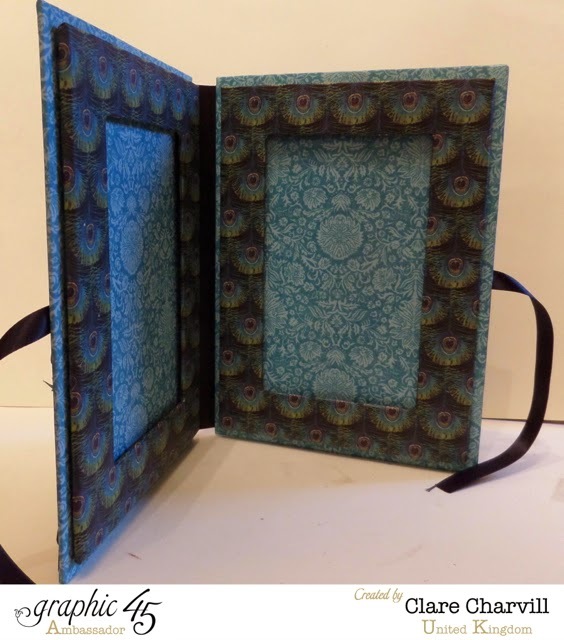 Hi Clare, this is a Awesome Double Frame Book you are such a Talented a Person I Love The Flowers and Fabulous Graphic 45 Papers. Good Luck to the Gift Winner. My granddaughter (who's 18 and going to college for her first yr) loves the couture collection. This would be awesome for her but I like it too. Thanks for the great prize. Another stunning piece - I love the way you put so many different elements together and they just all work. So inspirational and amazing creativity - I have become quite addicted to your work having only found you about four weeks ago! Just love everything you do . See you soon hugs.